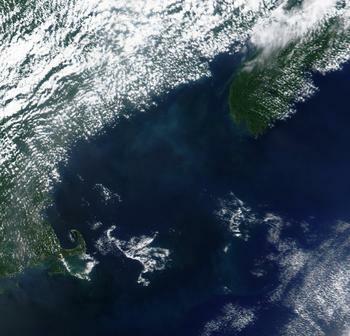 Phytoplankton bloom in Gulf of Maine, July, 2002. The bloom is 20 to 25 meters thick and contains nearly half a million tons of calcite. Image Source: NASA MODIS. Like all plants, phytoplankton need sunlight, carbon dioxide, water, and nutrients to grow. Because sunlight is most readily available near the surface of the sea, that's where phytoplankton develop. Phytoplankton contain chlorophyll-a, a pigment that gives the microscopic plants a greenish color. Depending on the phytoplankton species and their abundance in a region, the color of the ocean surface where they are growing actually changes color, ranging from green to brown to red. When these colors appear, the phytoplankton are said to be in "bloom." The blooms, which are essentially dense concentrations of chlorophyll, can be detected in satellite images. Scientists study these images to monitor the ocean's biological productivity. Commercial fishermen and whale watching boats also access these images; where phytoplankton are blooming, dinner is served! Schools of juvenile fish, sand lance, mature fish, and whales may also be found in these areas. Phytoplankton also play a critical role in the global carbon cycle. Phytoplankton consume carbon dioxide from the ocean during photosynthesis and emit oxygen as a by-product. In fact, more than half of the oxygen in Earth's atmosphere is produced by ocean phytoplankton. As a result of photosynthesis, the oceans are a net sink (or consumer) for carbon dioxide. If the amount of phytoplankton in the global ocean is reduced as a result of climate change, for example, atmospheric carbon dioxide could increase. Since carbon dioxide and water are readily available at the ocean's surface, the main factors that limit phytoplankton development are the availability of nutrients and sunlight. The nutrients phytoplankton need for growing (nitrate, phosphate, and silicate) are found in the colder, deeper areas of the ocean. Shifting ocean currents (called upwellings) and water mixing by wind bring these nutrients to the surface. When these nutrients are available at the surface and the amount of sunlight increases in the spring each year, the phytoplankton bloom. In this chapter, you will gain an understanding of the critical role phytoplankton play in the marine food chain by predicting the timing of the spring phytoplankton bloom in the Gulf of Maine. You will access historical buoy data on water temperature, salinity, and density-variables that influence the timing of the spring bloom. These data are available from buoy monitoring stations in the Northeastern Regional Association of Coastal and Ocean Observing System (NERACOOS). You will graph these data and interpret them to predict when the bloom should occur. You will compare your predicted bloom date to the actual date by examining chlorophyll data. Finally, you will acquire MODIS (Moderate Resolution Imaging Spectroradiometer) satellite images of this region from the University of New Hampshire's Coastal Observing Center to see the phytoplankton bloom as viewed from 640 kilometers (400 miles) above Earth.